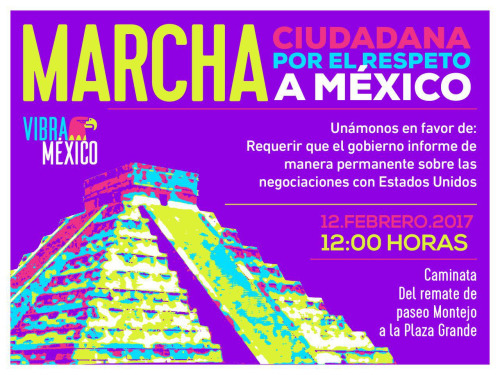 A total of 77 NGOs and universities are organizing ‘Vibra Mexico,’ nationwide demonstrations in several Mexican cities, against what they call “Donald Trump’s disrespect for Mexico”, and to demand a stronger and more energetic response from the Mexican government. As part of this movement, a march will take place in Merida at noon on Sunday Feb. 12 from the Remate of the Paseo de Montejo to the Plaza Grande. The organizing committee is integrated by the National University of Mexico (UNAM), the Center for Research and Economic Doctrine (Centro de Investigación y Doctrina Económica, CIDE), Amnesty International, Article 19, Cause in Common (Causa en común), the Colegio de Mexico, Free Letters (Cartas Libres), United Mexican States Against Corruption and Impunity (Estados Unidos Mexicanos contra la corrupción y la impunidad), Mexico SOS, Nexos, Tecnológico de Monterrey, Transparencia Mexicana, Universidad de Guadalajara, Universidad Iberoamericana, UAM, among others. During a press conference, some of the organizers emphasized that this march aims to express rejection and indignation against the words and actions of U.S. President Donald Trump towards Mexico. “What we are doing is for Mexico” said Enrique Graue, UNAM rector, during the national presentation of this act. During these simultaneous marches, demonstrators will require the federal government to place the rights of all Mexicans above any negotiations with the U.S.; and will demand permanent reports from the Mexican government on negotiations with the Trump administration.